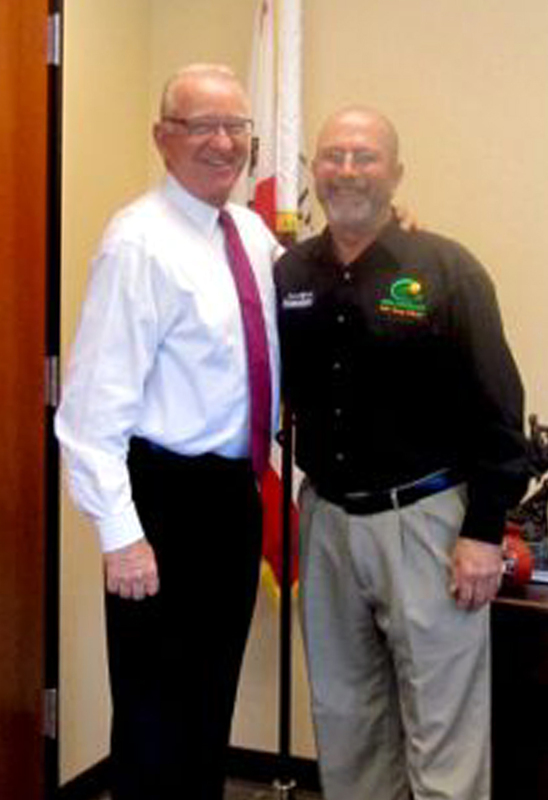 Mark Figearo, CEO and co-owner of Green Convergence, a booming Santa Clarita Valley based solar energy company, recently met with local Congressman Howard P. “Buck” McKeon. Figearo and McKeon discussed the future of the solar industry and how Green Convergence would continue to expand its business into the future. Green Convergence (GC) has continued to grow its business despite the economic downturn, outgrowing its first 5,000-square-foot building and added 36 employees to the opening staff of four in just 4 years. Figearo looks forward to the continued growth of the solar trend as businesses and residents all over the Santa Clarita Valley turn to solar for a reduction in energy costs as well as a reduction in pollution. Figearo is passionate about paying it forward. He was part of the Real Life Church construction team, which recently built the first USGBC Gold LEED- certified church building in the country. Figearo and Green Convergence have also partnered with Habitat for Humanity and the “SCV Habitat for Heroes” program. “Green Convergence is pleased to partner with Habitat to help our veterans and other citizens in the SCV area. Residential customers not only benefit from SunPower’s high efficiency, high reliability solar panels, but can take pride in knowing that they contributed to Santa Clarita veterans,” says Figearo. When a solar system is purchased through Green Convergence in Santa Clarita, a contribution of up to $2,000 will be made to benefit SCV Habitat for Heroes. The contribution is made possible through an agreement between Green Convergence and SunPower. With 30 years of experience in the construction business, Figearo has been a successful small business owner for more than two decades. Green Convergence is a SunPower Elite Dealer and are licensed roofing, electrical and general contractors. Homeowners wanting more information about installing SunPower high efficiency solar panels on their home while benefiting the Habitat for Heroes program can contact Green Convergence at 661-294-9495 or visit GC4Solar.com., or www.sunpowercorp.com/asp/habitatforhumanity.